Gangrene is tissue necrosis, or the death of tissue, in a certain part of your body. The National Center for Biotechnology Information states that gangrene develops when blood flow to a certain part of your body is impaired, often due to infection, traumatic injury or medical problems such as blood vessel disease, HIV or diabetes. Herbal treatments for gangrene may help reduce tissue death and decay, but you should always discuss herb-related topics with your doctor before pursuing this natural treatment method. According to MayoClinic.com, gangrene usually occurs in your extremities, including your limbs, feet, hands, fingers and toes. However, you may also develop gangrene in your muscles and internal organs. Gangrene may be associated with a bacterial infection or it may be caused by frostbite. If you have diabetes, are a smoker, abuse alcohol or have generally poor circulation, you have a greater risk of developing gangrene. Proper nutrition and a healthy lifestyle can help prevent gangrene or assist in your recovery. There are several herbs that may beneficially treat your gangrene. According to Phyllis A. Balch, a nutrition researcher and author of "Prescription for Nutritional Healing," butcher's broom effectively improves your circulation, while other herbal treatments, such as bromelain and turmeric, help reduce swelling and inflammation. Olive leaf is often used to help fight infections. Other helpful herbs for gangrene include bayberry, cayenne, echinacea, ginkgo, goldenseal and red seal. Non-herbal supplements, such as coenzyme Q10 and essential fatty acids, may also be beneficial. Butcher's broom is an herb that has been prescribed by health care practitioners to help treat gangrene. Butcher's broom, notes the Memorial Sloan-Kettering Cancer Center, has been helpful in treating many ailments, including circulatory problems, constipation, hemorrhoids, inflammation, leg cramps, lymphedema and varicose veins. Butcher's broom is well-known for its ability to improve circulation, reduce inflammation and treat carpal tunnel syndrome, Meniere's disease, obesity and thrombophlebitis. 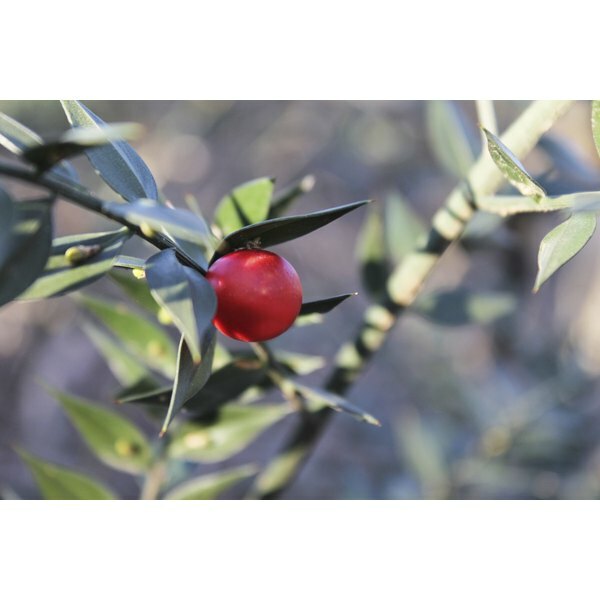 Butcher's broom is an evergreen shrub that grows in various parts of Europe and Asia. Established gangrene is treated with surgery to remove the problematic tissue. Gangrene is a serious health problem that can lead to amputation of various body parts. If your gangrene becomes infected with bacteria, it can rapidly spread to your organs. In this case, if your gangrene is left untreated, it may be fatal. Always check with your doctor about appropriate treatment strategies for your gangrene. A qualified health care professional can tell if what herbs may be helpful for your condition.